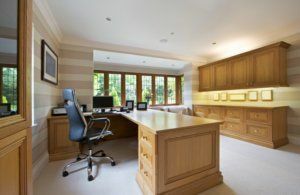 A few decades ago, when someone designed a home office, it was typically in the form of rich dark woods with a traditional, formal tone. Furnishings were often masculine in nature, and both heavy and cumbersome. However, the typical U.S. home office style has changed in recent years. In many houses, the home office is lighter and more streamlined to better blend in with the overall atmosphere of a home. In fact, today’s home offices come in all shapes and sizes. At Republic West Remodeling, we believe working with a professional home office remodeler to plan and design your home office is crucial. Home office remodelers can help you determine what you need for this space based on your preferences and style. If you are considering a home office remodel, the first step is to find an expert to help. By working with an expert, your home office will reflect your specific needs and personal style. With some creativity and imaginative ideas, the team at Republic West Remodeling can help you create a stunning home office. How do we accomplish this task? We know that what one person considers the perfect work environment may not be comfortable for someone else. By incorporating smart layout approaches and strategic arrangements, like built-in or hidden storage areas, we help you maximize your available space, helping us create a home office perfectly designed with your needs in mind. Contact us today to schedule your free, no-obligation professional home office remodel consultation with one of our team members.